The Sept of Gaia’s Vengeance is located deep in the Pine Barrens of New Jersey. Helped some by the barren forest cover and some by the legends of everything from cannibals to the Jersey Devil, they’ve managed to remain mostly undetected for the last several years. The leadership, while stable, is a constant balance of the more hardened war veterans and the younger and more modern Garou. While accepting of most in general, it is very clear it is a rural Sept.
Metis will be accepted into the Sept only if they name their parents. Before any Challenge, the Challenger must spend a day and a night atop the Challenge Mound, answering the questions of the Master of Challenges. If the Master of Challenges finds the Challenger’s motives unacceptable, they have the right to set the mound ablaze. Each member of the Sept must spend one week a year in service to the Sept. This service is typically maintaining the Hall of Heroes, though the Warder, Alpha, or a majority vote of the Council of Auspices can assign some other duty based on the needs of the Sept. The Alpha of each Pack must spend one week a year as a member of another pack, they may not hold a position in that Pack, and they must be accepted by that Pack’s Alpha. If a Garou refuses, or cannot find a Pack willing to take them in, they are named Dishonorable. Upon completion of this week of subordination, Garou are named Worthy. Note: The Sept Alpha, if an Alpha of a Pack, must also take part in this weeklong self-abasement. However, they do not receive the Moniker of Worthy. Tools of the Weaver are allowed within the Bawn, but they may not be taken into the Hall of Heroes or the Caern Heart. OOC Note: This means no cell phone use during games taking place at the Sept, unless for emergencies or Real Life™ issues. Sept members must receive permission from the Sept Beta before entering audience with the Alpha. Members of the Alpha’s Pack are exempt from this restriction. Any Kinfolk who desires to become Garou has the right to petition the Alpha for the Bite. This is the only time that a Kinfolk may directly approach the Alpha. Borrowing from Things Fall Apart (Achebe) and Heart of Darkness (Conrad), the ‘Rage Across the Pine Barrens’ game seeks to play with the idea of struggle, uncertainty, and horror. 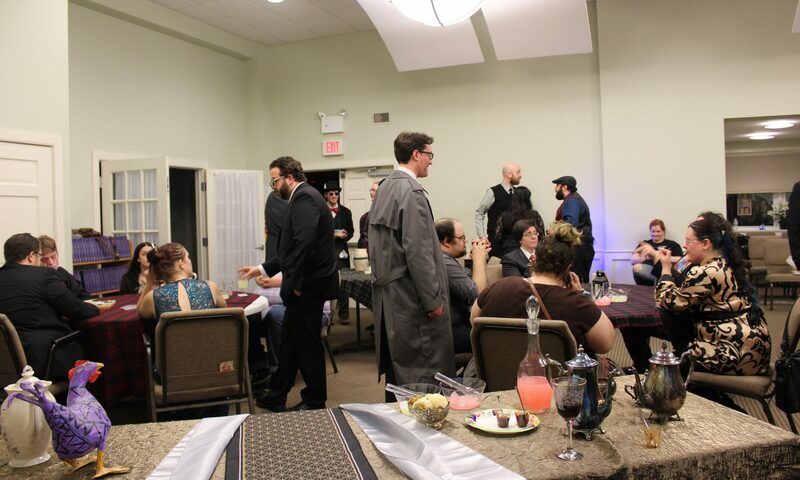 Our goal is to run a tense horror LARP, with confrontation and aggression as key conflict drivers. Our theme is Sinister Savagery. Werewolves are commonly thought of as savage. They are part human, part spirit, and part wolf. But wolves will not be the only predators in the pine barrens. Over and over we will see predatory archetypes in the world surrounding and inside of the Caern. Player characters will confront these ideas from various angles. The New Jersey Apocalypse game is a heavily Garou focused game. Fera are allowed within the Sept, but they will be the minority. There are a great many risks surrounding the area, not the least of which is the Sept itself. Visiting and/or new characters are encouraged to reach out to the Storyteller team to determine how they are making their way to the Sept, and what dangers may be encountered along the way. Volunteerism XP is earned through the following methods and must be recorded separately on XP logs.